Each winter, aerial survey teams of biologists from the Maryland Department of Natural Resources and U.S. Fish and Wildlife Service make visual estimates of ducks, geese and swans along the state’s coast and shoreline. This year, teams counted about 1,023,300 waterfowl, well above the 812,600 birds observed during 2017 and higher than the five-year average of 851,980. In general, biologists attribute much of the year-to-year variation to weather conditions in Maryland, as well as other locations on flyways used by migratory birds. Overall, dabbling ducks were higher (108,000) than last winter (87,900). Diving duck numbers (187,200) were lower when compared to last winter (283,600). Survey teams observed the most Canada geese (641,200) since the survey began in 1955. 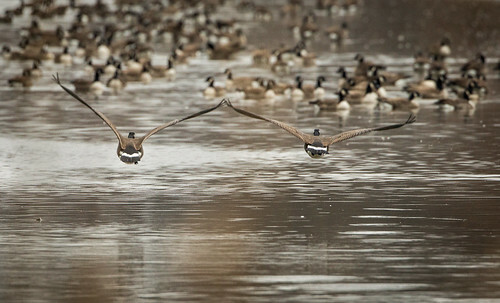 The 641,200 Canada geese observed in this year’s survey was higher than the previous record of 608,000 in 1981. An above average hatch by the Atlantic, or migratory, population Canada geese coupled with an influx of resident Canada geese from states to the north of Maryland, most likely account for the record high count. The Midwinter Waterfowl Survey has been conducted annually since the early 1950s. The Maryland survey results are ultimately pooled to provide a measure of the distributional changes and long-term trends of waterfowl wintering in the Atlantic Flyway.